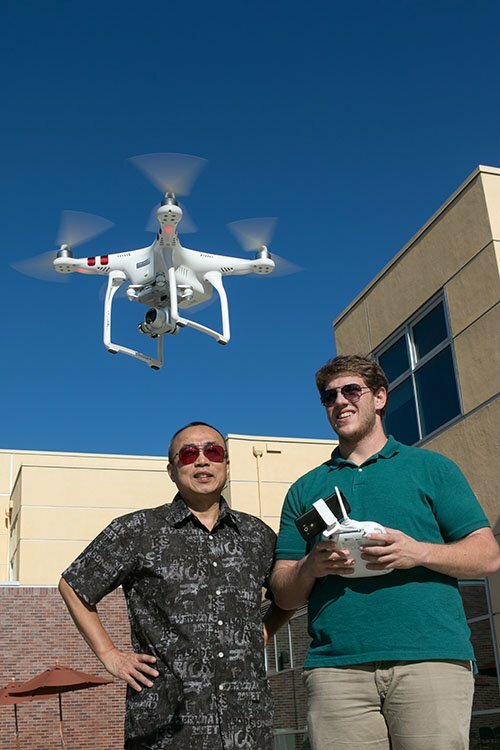 Henry Bulmer, shown with faculty mentor Chang-Shyh Peng, will present the app he developed to direct autonomous drones to take comprehensive crime scene photos in a fraction of the time required for traditional forensic photography. (THOUSAND OAKS, Calif. – Oct. 17, 2016) Thirty-one of California Lutheran University’s top undergraduates will present their findings at the 13th Annual Student Research Symposium on Saturday, Oct. 29. The event will be held from 9 a.m. to noon on the Thousand Oaks campus. With guidance from faculty mentors, the students conducted research in the fields of biochemistry, bioengineering, biology, chemistry, communication, computer science, education, environmental science, exercise science and physics.Most of the students spent the summer working full time on their projects. Six students will give oral presentations on some of the top projects from 9:15 to 10:30 a.m. in Richter Hall in Ahmanson Science Center. Henry Bulmer, a computer science and criminal justice major from Santa Clarita, will present the app he developed to direct autonomous drones to take comprehensive crime scene photos in a fraction of the time required for traditional forensic photography. Karie Portillo Guerra, a Ventura resident majoring in communication and marketing communication, and Kristiann Jones, a Seattle resident majoring in communication, will discuss the documentary on drought they researched and filmed. Brittany Davis, an exercise science major from Atascadero, will discuss the study she designed to look at why women fall more often than men by examining how female senior citizens descend stairs. Kacey Egusa, a biochemistry and molecular biology major from Auburn, will share her research on microbes in cattle eyes with pinkeye and conditions that thwart vaccine effectiveness. Nicholas Bui, a biochemistry and molecular biology major from Simi Valley, will explain how he analyzed gene expression data to determine how the Hepatitis C virus enters a type of white blood cell. Christina Sharkey, a biology major from Mill Valley, will discuss her test of how well pellets containing amino acids attract aquatic snails, which are used in studies of neural processes that govern some behaviors. All the students will present their results in demonstrations and posters and talk to visitors from 10:30 a.m. to noon in Ahmanson Science Center lobby. The presentation of awards for excellence, dedication and leadership will kick off the day in Richter Hall. Refreshments will be served. Ahmanson Science Center is located on the south side of Memorial Parkway between Pioneer and Regent avenues. Admission to the symposium, which is sponsored by the Office of Undergraduate Research and Creative Scholarship, is free. For a complete schedule, visit CalLutheran.edu/srs. For more information, call 805-493-3796 or email OURCS@callutheran.edu.